Our fall knitalong, Halite, is a universal sweater — it can be knit in any yarn at any gauge to fit any size! 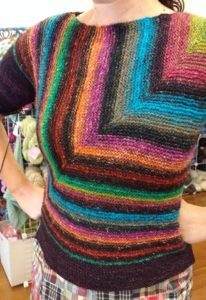 The sweater front features a mitered square that creates a diagonal ‘seam.’ It shows off variegated yarns especially well, but also looks great in a solid color. The back and sleeves are knit in a neutral contrasting color. The back features a second design with four miters. The kimono-style sleeves are picked up and knit from the sweater body, and can be knit to any length. Because the sweater can be knit in any weight of yarn, gauge is unimportant. Just pick a needle size appropriate for your yarn and you’re good. The sample front was knit in Silk Garden Sock; the back in Tosh Merino Light. Likewise, the sweater will fit any size. Just take a couple of basic measurements and you’re on your way. No complicated shaping is involved. The knitalong kicks off Saturday, September 24. More details are in our fall newsletter 2016.